OBJECTIVES: Describe informal allopathic practitioner (IAP) knowledge and practice about management of hypertension and identify gaps in IAP knowledge and practice amenable to interventions. METHODS: A cross sectional descriptive survey of 642 IAPs in Kamalapur (urban) and Mirsarai (rural) Bangladesh was conducted from March to April, 2011. Using a structured, pre-tested questionnaire sociodemographic, training, knowledge and practice data about management of hypertension was collected. Comparative statistics were preformed to show differences between urban and rural practitioners using SAS 8.0. FINDINGS: 99.4% of IAPs were male, mean age was 37.5 (12.5 SD) years. Greater than 65% correctly identified the upper limit of normal blood pressure. 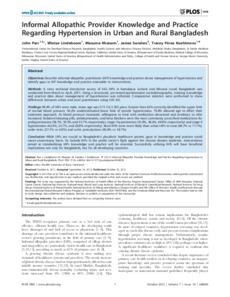 50.2% underestimated lower limit of systolic hypertension. 79.8% allowed age to affect their treatment approach. As blood pressure increased, willingness to treat with medication decreased and tendency to refer increased. Sedative/sleeping pills, antidepressants, and beta blockers were the most commonly prescribed medications for prehypertension (58.7%, 50.3% and 53.7% respectively), stage I hypertension (55.0%, 38.6%, 49.8% respectively) and stage II hypertension (42.4%, 23.7%, and 28.8% respectively). Rural IAPs were more likely than urban IAPs to treat (84.7% vs 77.7%), order tests (27.1% vs 6.0%) and write prescriptions (60.4% vs 18.7%). CONCLUSION: While IAPs are crucial to Bangladesh's pluralistic healthcare system, gaps in knowledge and practice could cause unnecessary harm. To include IAPs in the public sector's fight against the chronic disease epidemic, interventions aimed at standardizing IAPs knowledge and practice will be essential. Successfully utilizing IAPs will have beneficial implications not only for Bangladesh, but for all developing countries.